If you are in Central Kentucky and need slate roof repair, please allow our slate roofing specialists at Thomas Quality Construction to take care of your needs. Our slate roofing specialists will perform high quality work in a timely manner. Slate roofing is generally known as one of the highest quality, longest lasting roofing materials on the market. Because slate is often called a “100-year-roof”, homeowners sometime assume that it doesn’t need maintenance for a century. Slate roofs should be inspected annually. 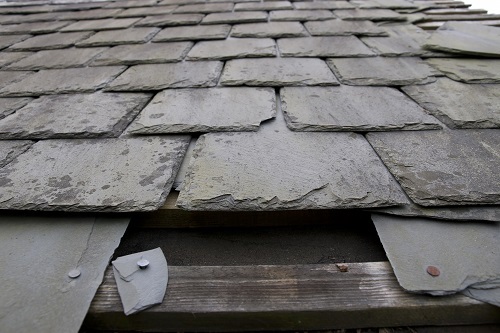 The most common defect encountered on slate roofs is inappropriate repairs. With a service life ranging between 75 to 200 years, slate is the most durable of all roof coverings. For slate roofs, flashing is often the weak link. Copper and galvanized steel are the most common flashing materials used with historic slate roofs. However, slate roofs commonly outlast the flashings. If the flashing leaks, the roof will also leak. The solution is not to use excessive amounts of caulking or use other sealants, but to replace the flashing. Copper flashings have a service life of about 70 years and are maintenance free. Copper will turn a dark brown, then a rich green. The green color lets you know that the flashings are getting older, but still have service life left in them. Galvanized flashings can last between 15 and 20 years and need to be kept painted or they will rust quickly. Galvanized flashings will be more economical for you if you need a repair. Fasteners are also important in extending the life of a slate roof. Cut steel nails, copper wire nails and galvanized steel nails are the most common fasteners used with slate roofing. Few homeowners would argue with the premise that a slate roof adds beauty and value to a house. But while slate roofs are often thought to be virtually indestructible, with some having been around for over 100 years, even the best slate roofs age, leak and eventually have to be replaced. When 20% to 30% of the slate tiles on a roof need replacement, it is usually more prudent to replace the entire roof than to perform annual repairs. There is a variety of sizes, shapes, colors and styles of slate roofs. Most slate roofs can be divided into two basic categories: hard and soft. Hard slate will last anywhere from 75 to 200 years. Soft slate will last 50 to 125 years. A homeowner trying to decide whether to repair, restore or replace a slate roof should have Thomas Quality Construction determine whether the existing slate roof is hard or soft. Your roof is the most important part of your home. Not every roof is identical and not every roofing company is the same. Slate roofs are precision systems that require regular inspections and maintenance to ensure they last a long time. Thomas Quality Construction has experience with all types of roofing materials. We always offer the most professional roofing repair services, including slate roof repairs. No slate roof repair job is too difficult or too small for Thomas Quality Construction. If you need slate roof repair, contact us today.